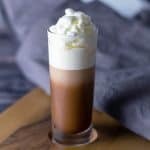 Salted Caramel Kahlua Layer Shot combines hot chocolate, salted caramel Kahlua, Rumchata, and whipped cream into this sinfully delicious cocktail. You will want to have a few of these babies to keep you warm during these chilly winter nights. In a tall shot glass, pour the hot chocolate. Next, insert a small spoon with the back facing up, slowly pour in the Salted Caramel Kahlua. Just want the Kahlua to sit on top of the hot chocolate. Then, do the same spoon method for the Rumchata so it can sit on top of the Kahlua.